Chief Rabbi David Lau urges French Jewry to be kinder to one another, keep observing commandments in light of tragedy. 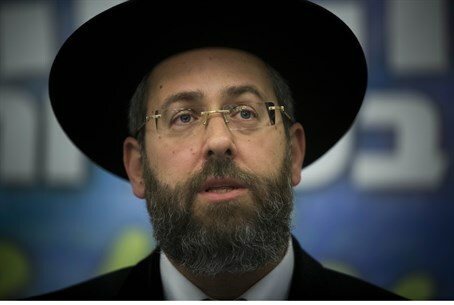 Chief Rabbi of Israel, Rabbi David Lau, has sent a condolence letter to rabbis and Jewish community members in France Tuesday, following an Islamist's rampage on a kosher supermarket in Paris last week. "Along with the Jewish world, we are horrified to hear about the terrible attack that occurred at a kosher supermarket in Paris, which killed four holy and pure Jews, who stormed the heavens and died sanctifying G-d's name, just because they are Jews, and were murdered in the prime of their lives just for seeking to keep on eating kosher food, as Jews believe," Rabbi Lau said. "The murderous attack tears at the heart of every Jew, in Israel and France, in the US and globally, and joined the bad feeling that prevails these days in your country, France, when bloodthirsty terrorists are trying to harm innocent civilians," he continued. "Our eyes are filled with tears, are hearts are torn with pain, and our thoughts are with you in these difficult times." Rabbi Lau then urged the Jewish community there not to abandon their faith, but to strengthen it. "It is our duty and obligation of the times we live in now, not to weaken our faith or succumb to fear - on the contrary, we must strengthen and improve our way of life, between man and his fellow, to increase our friendship and love for fellow man during these misfortunes," he said. "[We must also] strengthen our faith and commitment to eat kosher food - in the face of many temptations faced by Jews in Israel and the Diaspora." Rabbi Lau added that the four victims would be remembered along with the generations of Jewish people who were killed in G-d's name for being Jewish over the centuries, which he assured merited a high reward in the afterlife. In more practical terms, he encouraged French Jews to immigrate to Israel, becoming yet another voice in a chorus of calls to bring the community over to the Jewish state en masse. Philippe Braham, 40, Yohan Cohen, 22, Yoav Hattab, 21, and Francois-Michel Saada, in his 60s, will be buried in Israel Tuesday afternoon.